A rendering of the $75 million complex planned for the Home for Little Wanderers campus in Jamaica Plain. 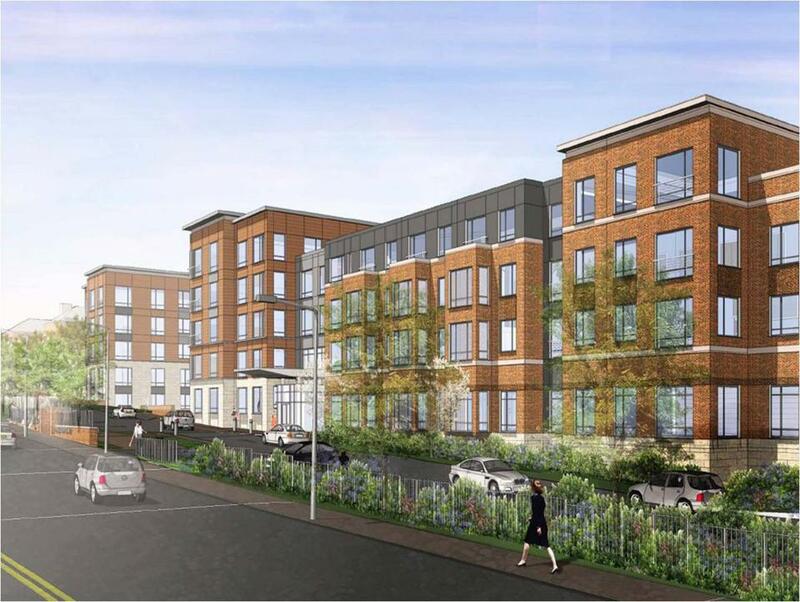 A $75 million proposal to replace the former Home for Little Wanderers complex in Jamaica Plain with a 196-unit housing development cleared a key hurdle in City Hall Thursday despite strong opposition from neighbors. The Boston Redevelopment Authority gave its blessing to the project Thursday. The only remaining approval it needs is from the Zoning Board of Appeals, which has scheduled a hearing on it for Nov. 13. Boston Residential Group is proposing to build a four- and five-story building on South Huntington Avenue with apartments ranging in size from studios to three-bedrooms, and a garage with 147 parking spaces. The company said it was pleased with the BRA vote and anticipates approval from the zoning board. City officials said the developer made concessions by making the building less imposing, agreeing not to rent to students, and pledging to make more of the units available as affordable housing. But neighbors are upset the BRA went ahead with approval despite their continued objections. They said the proposed complex is still too big, has too few affordably priced units, and calls for the destruction of a century-old building they would like preserved. “It’s outrageous that the BRA board would approve the project with pretty much unanimous opposition in the community,” said Benjamin Day, chairman of the Jamaica Plain Neighborhood Council, a local organization that advises City Hall on issues such as new developments. The group’s zoning committee recently voted unanimously to oppose the project at the Little Wanderers site. The Home for Little Wanderers, a child and family services nonprofit, has roots in Boston tracing back 213 years to the founding of an orphanage. But the agency left its Jamaica Plain campus this fall, saying it could not afford to remain in its older buildings. Some of its programs and services were relocated to its 166-acre campus in Walpole. Construction on the new project would begin in April and take about 18 months, city officials said. Meanwhile city regulators are reviewing a proposal for another housing project nearby on South Huntington, that would clear a wooded lot for a 12-story, 195-unit building, with a parking garage and retail. Also on Thursday the BRA approved a $172-million proposal to renovate and expand the Boston University School of Law tower, a 24-unit apartment building in the vacant Gate of Heaven gymnasium in South Boston; and a six-story apartment building on Boylston Street, near the Back Bay-Fenway border.